2019 Silver Britannia Proof Coin Commemorates Trio of Numismatic Anniversaries! Following their conquest of the British Isles in 43 A.D., the Romans named their new province “Britannia” – a Latinisation of Pretanī, the native word for the island. With that name came the female personification of the island, a warrior goddess armed with a trident, shield and Corinthian helmet. While Great Britain continues to change and evolve, the figure of Britannia still stands tall, representing the ideals of pride, fortitude and progress. In 2019, Britannia reigns supreme once again on the Royal Mint’s latest Silver Britannia Proof Series that features a new, one-year-only design. This year’s portrait of Britannia is not only a stunning portrayal of the warrior queen, it’s also a tribute to a series of key milestones in British numismatic history. The design depicts Britannia on the coin’s reverse as an armed warrior leading a fierce lion into battle. It’s a 180th anniversary reimaging of the famous “Una & the Lion” design that appeared on an 1839 coin honoring the coronation of Queen Victoria. The young queen was depicted on that coin as Princess Una from Edmund Spenser’s poem The Faerie Queen. This year also marks the 1,900th anniversary of the first time Britannia appeared on Roman coinage in 119 A.D. Additionally, 2019 marks the 200th anniversary of Queen Victoria’s birth, giving this year’s release not one, not two, but THREE milestone anniversaries in one fell swoop! Great Britain’s Royal Mint introduced its premier Gold Britannia bullion series in 1987 and followed it up 10 years later with the Silver Britannia series in 1997. Today, the Britannia coins are among the most premier names in precious metal coinage. And while the bullion edition of the Britannia has kept its same design since 2013, each year brings an exciting new design to the Britannia Proof releases – and this year is no different! With a new contemporary design by one of England's rising young artists, we're proud to bring you this 2019 Britannia One-Ounce Silver Proof! 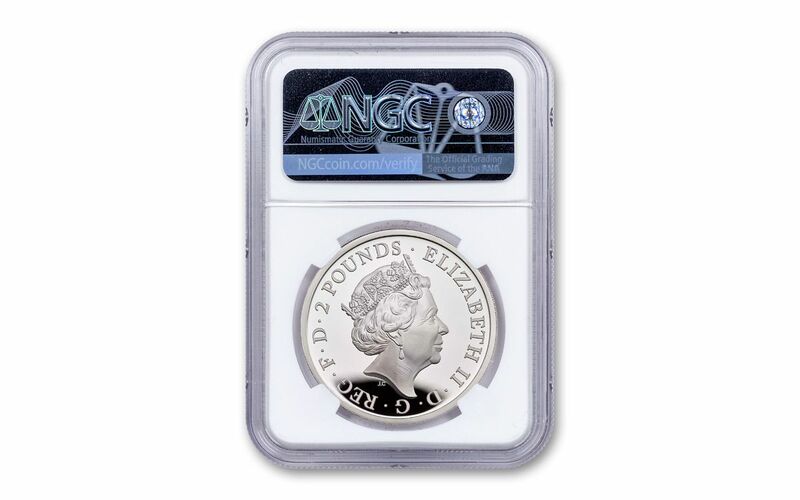 Struck in one ounce of highly-pure 99.9% silver by the artisans of the Royal Mint, this coin is £2 (two pounds) legal tender in the United Kingdom. 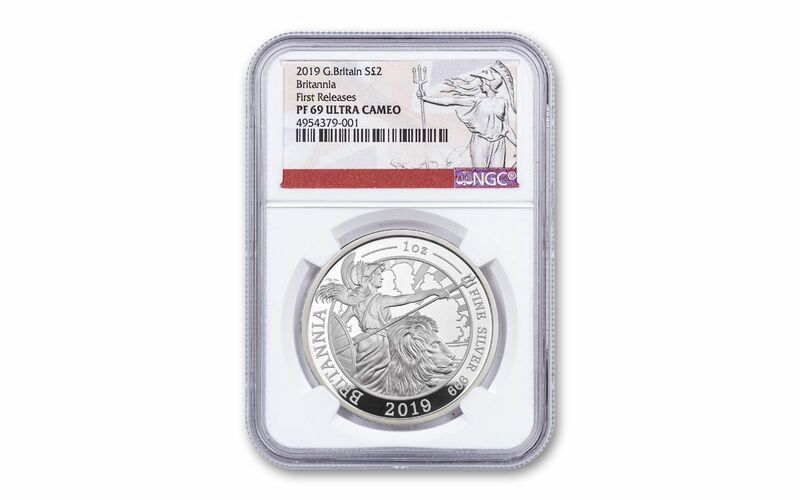 Your 2019 Britannia One-Ounce Silver Proof has been graded by the Numismatic Guaranty Corporation (NGC) as being in near-perfect Proof-69 Ultra Cameo (PF69UC) condition, a distinction that means your almost-flawless coin will showcase an impressive full strike and indistinguishable imperfections – well above and beyond the quality of the vast majority of coins in the series! In addition, NGC has graded your Silver Britannia Proof to be First Releases (FR) coin, a designation that means it was received by NGC or an NGC-approved depository within the first 30 days of its release. Like the others that came before it, this 2019 Britannia One-Ounce Silver Proof both establishes and reimagines an enduring symbol of British strength. Whether you're new to the Britannia series or a longtime collector, coin fanatic or Anglophile, this vision is one worth bringing home. And with only 3,390 coins for worldwide release, you’ll need to act fast to guarantee you get your Silver Britannia Proof! Don't miss this opportunity – order yours today! CLASSIC, ENDURING DESIGN – Standing steadfast in her defense of the British Isles, Britannia is the embodiment of Great Britain. She is featured on the coin’s reverse as an armed warrior leading a fierce lion into battle. The coin’s obverse depicts Her Majesty Queen Elizabeth II. EXPERTLY MINTED, HIGHLY PURE SILVER – The 2019 Britannia One-Ounce Silver Proof is struck in one ounce of highly-pure 99.9% silver by the artisans of the Royal Mint, resulting in coins that exhibit superb details and beautiful, lustrous finishes. UK LEGAL TENDER – These 2019 Britannia One-Ounce Silver Proofs are legal tender in the United Kingdom, with a denomination of £2 (two pounds). GRADED IN NEAR-PERFECT PROOF CONDITION – Your 2019 Britannia One-Ounce Silver Proof has been graded by the Numismatic Guaranty Corporation (NGC) as being in near-perfect Proof-69 Ultra Cameo (PF69UC) condition. KEY FIRST RELEASES CERTIFICATION – NGC has graded your Silver Britannia Proof to be a First Releases (FR) coin, a designation that means your coin was received by NGC or an NGC-approved depository within the first 30 days of its release. EXTREMELY LIMITED EDITION – The British Royal Mint has limited this release to just 3,390. Britannia, the embodiment of a nation and icon of maritime sovereignty, has symbolized Britain for centuries, appearing on coins dating all the way back to the Roman Empire! This favorite of collectors around the world is met with high demand year after year. Don't miss out on this chance to secure your own Silver Britannia Proof – order yours today!